Double Desire take your fancy? 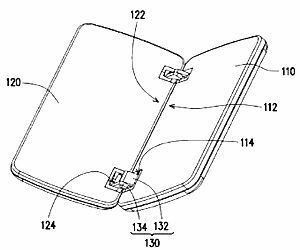 A patent has been filed by HTC that suggests the company is working on a dual screen folding device that looks remarkably similar to the Microsoft Courier concept that has ignited the web. HTC has established itself as one of the stellar performers in mobile tech, with phones like the HTC HD2 and Desire, and could well be looking to move up among the netbooks, tablets and MIDs. The patent filing was outed by Chinese language site Zol, and kindly translated by Gadget Mix. The dual screen layout is not something that only the Microsoft Courier concept has used, of course, with people like OLPC also jumping on the double touch-screen bandwagon, and Nintendo's DS well established in the gaming world. But given HTC's success with smartphones, with responsive touchscreens and the widely appreciated Sense UI adaptation of the Android OS, its devices are riding high at the moment. The device will open out into a single screen – although the hinges look a little cumbersome – and the bottom screen will turn into a keyboard. Businessphone, iPad rival or mobile internet device? You decide.